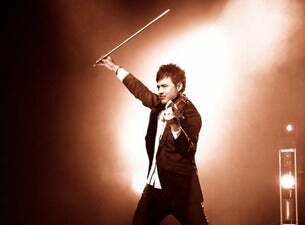 The Global Violin Sensation and Australia’s answer to Andre Rieu, Patrick Roberts will be hitting the stage at The Forum on Friday July 15 with the most amazing array of energetic and popular masterpieces. Widely considered an Australian TV phenomenon, Patrick Roberts has broken the mould of classical music. With performances and collaborations with Marina Prior, Anthony Callea, Rhonda Burchmore and many more Patrick Roberts’s emotion and feeling on stage truly transports you into his amazing world where he magically makes the Violin speak. Widely known for his remarkable performances every year on The Good Friday Appeal (Network 7), Carols By Candlelight (Nine Network), and live international productions; this dynamic artist will showcase an array of lively and heartfelt songs of The Beatles, Frank Sinatra, Josh Groban, Led Zeppelin and many more. Patrick Roberts’ latest album Vision (advertised on Australian TV) comprises of some of the greatest musical masterpieces of all time; some of these inspirational songs such as “You Raise Me Up”, “I Dreamed a Dream”, “Concierto De Aranjuez” and the all time classic “My Way” will be featured in this forthcoming show on July 15. Patrick Roberts can’t wait to hit the stage in his home town of Melbourne and will once again deliver a spectacular evening that is not one to be missed!